Home / Prints for sale / Tropical forests / Red-backed Thrush, Kabena, Indonesia. 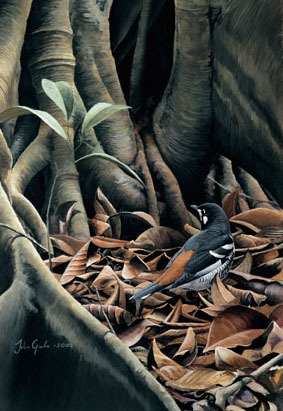 This painting is the front cover of the 2002 edition of Forktail journal (Oriental Bird Club). This new race of Red-backed Thrush was discovered on the Island of Kabaena, Indonesia in 2000.